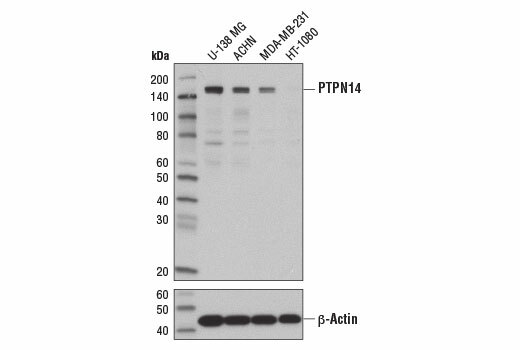 PTPN14 (D5T6Y) Rabbit mAb recognizes endogenous levels of total PTPN14 protein. Monoclonal antibody is produced by immunizing animals with a synthetic peptide corresponding to residues surrounding Leu737 of human PTPN14 protein. Tyrosine-protein phosphatase non-receptor type-14 (PTPN14, Pez, PTPD2 and PTP36) is an evolutionarily conserved non-membrane tyrosine phosphatase with homology to the band 4.1 family of proteins (1-3). The PTPN14 protein contains an amino-terminal FERM (4.1-ezrin-radixin-moesin) domain, which suggests plasma membrane localization of the protein, and a carboxy-terminal protein tyrosine phosphatase (PTP) domain (4). Research studies have identified possible roles for PTPN14 in multiple, diverse signaling pathways, including cell growth and proliferation, cell migration and adhesion, and development. The PTPN14 phosphatase regulates the subcellular localization of YAP in a cell density-dependent manner, indicating a role for PTPN14 in the Hippo signaling pathway (5). The Drosophila PTPN14 homolog Pez localizes to adherens junctions, where it may regulate cell motility through dephosphorylation of β-catenin (3). PTPN14 may play a role in epithelial-mesenchymal transition through effects on the TGF-β signaling pathway (6), and interacts with VEGFR3, a receptor tyrosine kinase involved in lymphangiogenesis (7). Loss-of-function mutations in the PTPN14 gene are associated with colorectal cancer (8), and choanal atresia and lymphedema, an autosomal recessive disorder characterized by defects in both nasal passage development and lymphangiogenesis (7). Smith, A.L. et al. (1995) Biochem Biophys Res Commun 209, 959-65. Ogata, M. et al. (1999) J Biol Chem 274, 20717-24. Wadham, C. et al. (2003) Mol Biol Cell 14, 2520-9. Wadham, C. et al. (2000) J Cell Sci 113 ( Pt 17), 3117-23. Wang, W. et al. (2012) Genes Dev 26, 1959-71. Wyatt, L. et al. (2007) J Cell Biol 178, 1223-35. Au, A.C. et al. (2010) Am J Hum Genet 87, 436-44. Laczmanska, I. and Sasiadek, M.M. (2011) Acta Biochim Pol 58, 467-70.